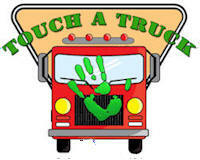 DIY - Touch A Truck fundraiser! enough venue, maybe a local mall will let you use a portion of their parking lot. Rope off the area and charge admission. Kids of all ages love to see fire trucks, ambulances, dump trucks, and backhoes up close and personal. Some proud owners may polish up their vehicles for the occasion and be willing to stand by to answer the kids questions or even let them climb in or on the vehicle. Approach city maintenance departments regarding the temporary loan of a garbage truck, snow plow, road paving equipment, etc. Ask local construction companies for a crane or cement mixer. Approach area farmers or farm equipment dealers for a tractor, combine or other equipment. You’ll want to arrange for at least one eighteen wheeler, maybe even a moving van. Think delivery trucks, mail truck, UPS, FedEX. How about a Greyhound or other tourist bus? Is there a military installation or depot nearby? Ask the ROTC or National Guard to participate. You might even arrange for a helicopter. See how many different kinds of vehicles you can muster, the possibilities are endless! Have a sandwich board by each vehicle, or a large sign or program passed out at the gate acknowledging the various donors and thanking them for their participation. You should also send an individual follow-up thank you to each with information on how much money you raised and how it will be used. Besides the ‘gate’, you could sell refreshments and baked goods. Post flyers and signboards around town and neighboring areas and send out news releases. Be sure to get your event included in the community bulletin boards or calendars of local newspapers and radio stations. If your charitable cause is unique or universal enough, you might even get a local radio to broadcast from your event. A great fundraising idea! Alternative: A ‘Touch A Truck’ fundraiser for childhood cancer research featured a variety of delectable offerings from some of the hottest mobile food chefs around. Perhaps you’ve already heard, but food trucks are hot, hot, hot right now with gourmet food trucks hitting the streets and bringing innovative, freshly-prepared and cooked meals to the mobile masses. These are not the “roach coaches” of old – rather, they are “Gastrotrucks” with diverse menus offering classic southern BBQ, farm to street interpretations of classic food truck fare, and even Mexican/Asian fusion. Not workable for all locations but it is something to consider.